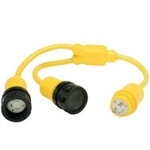 Male Plug: 50A 125V Locking, attaches to dockside receptacle or cordset. Note: Pigtail adapters are equipped with covers and sealing collars (where indicated) and are for use in wet locations. 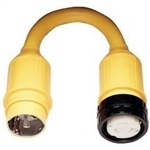 MARINCO'S unique sealing collar system with cover joins the adapter to the cordset with a positive, mechanical connection which provides maximum moisture protection.